There is almost no Muslim today who is oblivious to the acts of oppression and injustice directed daily towards his/her brothers and sisters in various parts of the world. The heartfelt cries of the Ummah in the last ten nights of Ramadan echo the names of Iraq, Afghanistan, Chechnya, Kashmir and Palestine constantly. Who hasn’t shed a tear, emptied their pockets or cried out to their Lord in the depths of the night for the oppressed in these nations alhamdulillah? However, there is one part of the world where the cries of our brothers and sisters have gone completely unheard. So great is this cover up that most Muslims do not even believe any of our brethrin even live there let alone of the situation they face. Who are they you ask? They are none other than our brothers and sisters of Ahlus-Sunnah in the Majoosi/Safavid/Rafidhi state of Iran. Alhamdulillah much has been written and spoken about the situation of Iranian Sunnis by the Iranian Sunni Scholar currently living in exile in London, Sheikh Abu Muntasir Al-Balushi (hafidhahullah). I feel it is extremely important to bring attention to our forgotten brothers and sisters in this part of the world who have literally been pushed to the outer boundaries of the nation of Iran when in fact they themselves were it’s original inhabitants. Islam has had a long history in this area since the days of Umar bin Al Khattab (ra) who brought the people of this land out of the darkness of the fire worshipping Zoroastrian/Magian religion to the light of Tawheed. Indeed this land has produced some of Islam’s finest scholars, Imams Muslim, Tirmidhi, Nasaa’i, Abu Dawud and Abu Hanifa were all either Persians or of Persian ancestry. This is before we even mention the noble companion of the Prophet (saw) Salman Al-Farsi (ra), upon who’s suggestion the Prophet (saw) ordered the trench to be built around Madinah in defence of the city for the Battle of Al-Ahzaab. Surely we can see why Imam Bukhari has an entire baab, an entire section entitled “Virtues of the People of Persia” in his monumental compilation of ahadeeth, Saheeh Al-Bukhari. So now, what of the situation today? It is extremely important that, in the current political climate where emotions are running high, we must look much deeper into the issue of Iran and the truth behind it’s majority inhabitants. Today many weak minded ill-informed muslims are calling for “brotherhood” and reconciliation between the Muslims and the Rafidah. Hizbollah is seen as just that and many prominent du’aat are even suggesting that such “petty” differences be put aside and that we unite for the “greater good”. Prominent scholars such as Sheikh Ibn Jibreen were ridiculed for prohibiting support for and funds to be sent to Hizbollah and other Rafidhi groups during the Israeli conflict that took place recently. Praise is being heaped upon major Rafidhi figures and figureheads for their so-called resistance to western policies and pressures. Even many of our own so called imams preach in their khutbahs that the difference between Sunni and Shi’a is nothing except like the differences found between the four madhaahib. 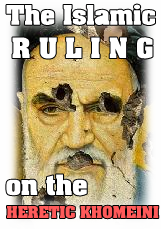 Therefore it is imperative that the true nature of Iran, the state of Khamenei (the current Supreme “Overlord” if you like) be made apparent for the benefit of the Muslims. Firstly so’s that they become aware of what it’s true intentions are, especially for example in understanding their resistance towards Israel and the aid given to Palestine. And secondly so that we are made known of and can make others aware of the horrendous oppression, torture, killing and coercion that our brothers and sisters of Ahlus-Sunnah face at the hands of the Rafidah. They have been unbelievably successful in hiding the situation there firstly due to their lying and deceitful nature which is a cornerstone of their religion, and secondly due to the ignorance of the common Muslims themselves today. The Iranian intelligence services have ruthlessly tracked down and assasinated many prominent Sunni scholars and ordinary people alike for many years now at the behest of the bloodthirsty Khamenei. Many schools, masaajid and institutions which had been in place before even the time of the Shah by the Sunnis have now either been razed to the ground or shut down under immense pressure from the Safavid government. The city of Tehran has plenty of OFFICIAL churches, synagogues, temples and other places of worship. Yet you will not find even one Sunni masjid, this is a fact. The fire worshipping Magian, Abu Lu’lu Al-Majoosi who was the murderer of Umar ibn Al-Khattab (ra) has a huge shrine built around his grave. This mushrik who died as a fire worshipper has his grave now decorated and revered, visited by countless Shi’a every year where they invoke upon him to fulfill their needs, calling him Hazrat even! This “brotherhood” and “unity” that the Rafidah call for is nothing but a smoke screen, empty words that hide their true actions and intentions. The so called unity they call for is built upon nothing but the blood and bullet riddled bodies of Ahlus-Sunnah in Iran. With one face they call to unite against western oppression, with the other face well…….you’ve read enough. Bi’idhnillah this blog will serve as a pulpit for all English Speaking Iranians Sunnah and their brothers and friends. Official Disclaimer: The contents of this blog are for informational, educational, study, and research purposes only, and, as such, are intended for readers of all religions and nationalities. The contents of this blog are not meant to provoke any type of action. Rather, the contents are meant only to provoke thought and bring insight into the nature of the political situation in Iran. Likewise, the contents are intended to encourage readers to judge the current political realities on their own, without having to rely on the information fed to them by their governments, Western or otherwise. http://www.sonsofsunnah.com does not support or fund any external bodies or entities, and is an organization with strictly intellectual intents and purposes. We also do not support any group be it inside or outside of Iran, be it Sunni or non-Sunni. Past remarks on our part (towards fighting Sunni organisations inside Iran) do not represent our views anymore, for we do not believe in any violance towards any civilians/innocents whatsoever, this of course, does not mean that we reject the right of Iranian groups (be it Sunni or non-Sunni) to defend their rights by a physical resistance against the Iranians dictatorship regime and it’s military forces (a right which is even giving to them and all nations by the U.N. itself, under certain circumstances). Our stance towards Terrosism: Our stance is the stance of Islam, which is represented by the MAJOR scholars of Islam during every age. Those major scholars have frequently warned and condemned all sorts of Terrorism/Extremism not matter how much the enemies of Islam tried to ascribe Terrorism as part of Islam. The position of the Major Salafi-Sunni scholars and hence the position of www.sonsofsunnah.com on terrorism and every person and group that it related to it. External Links Disclaimer: These recommended links on our site are provided to offer readers further relevant information that they may wish to explore. http://www.sonsofsunnah.com is not responsible for the content of external websites. The inclusion of a link to a third party website from this website should not be understood as an endorsement. we appreciate your efforts and help brother, but since the page hasn’t been created by us, we urgue you to mention that this this page of yours is NOT run by the admins of http://www.sonsofsunnah.com, you can keep it as a fan page and MENTION that it is run by you, as for contributing, currently we have no time. I couldn’t resist commenting. Ѵery ԝell written! Assalamu ‘alaikum. i’m going to write a thesis on Shiite Sufism, can you help me? do you mind if I translate the short biography of Imam al Tabari into German? Of course I would add the link to your page to it. Salamullah ‘alaikum. I’m your brother hanit bin osman al-ansariyy from malaysia. Can you help to get shia kitab on sufism, in english or arabic, and writtten by shia sufism figures themselves. i’m going to start my research.